I admit that I started celebrity trainer Val Waters‘s Red Carpet Ready program with a healthy dose of skepticism about what it could actually do for me since I’ve been training and eating clean pretty consistently for over 4 years now, but I can’t argue with the numbers below. 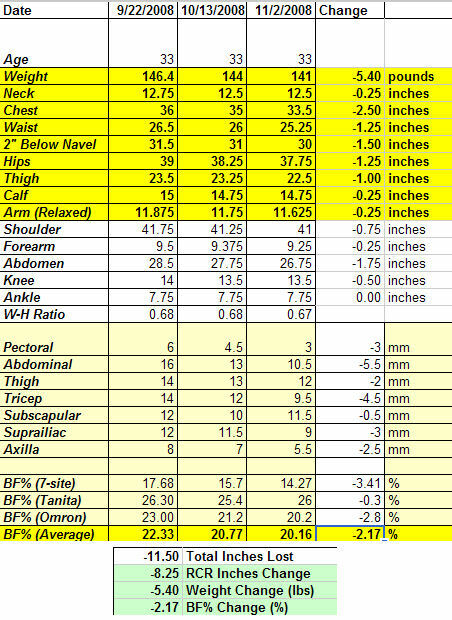 I have lost 5.4 pounds in 6 weeks (This is very good for me based on past experience, especially given that it is PMS week for me; I am not one of those people who ever averages more than 1 pound a week unless I eat at starvation levels and do over an hour of cardio a day), dropped 2.17% body fat, and reduced my measurements by over 8.25″ (based on Val’s requested measurements) and 11.5″ based on my bonus measurements. For someone as acclimatized to hard exercise and clean eating as I am–I am a poster child for homeostasis–these were very good results indeed. As a gold level member of the newly-launched Red Carpet Ready Club site (A complimentary two week free trial is included when you sign up, then it is $27/month afterwards), I had access to the RCR ebook, a library of video clips demonstrating the exercises, MP3/Ipod downloads of several of the workouts (with more to come in upcoming months), video interview archives of Val and various fitness experts and celebrity clients from the RCRC launch event, and several bonus RCR workouts on top of the four included in the book. The other major factors I found incredibly helpful in this contest were the Red Carpet Ready Club online community and Val’s weekly web chats. Val’s chats were always informative, motivational, and encouraging–often just what I and others needed to keep us going for another week of workouts and healthy meals. I especially appreciated the fact that she would take time to address the specific concerns and questions of those of us who weren’t even in her Platinum coaching group. I always felt that Val was 100% invested in the success of all of the members of the club, regardless of their membership level. Equally important was the advice, support, and general good cheer of the other RCRC members on the community forums. It’s never easy to embark on a lifestyle overhaul, but it makes you feel a lot less alone and overwhelmed when you can share your triumphs, slips, and daily exercise/diet minutiae with a few dozen other women who are doing the EXACT same program. I confess that eating clean and working out for 30-60 minutes a day was pretty old hat to me already, but I can still recognize the value of and need for a supportive circle to help newbies get started and veterans stay focused. I more or less followed the meal plans provided with the RCR ebook, choosing my main meals and snacks from the healthy options given by Val in her “Nutrition of the Stars” chapters. My calories averaged 1450-1600 per day since I normally went with the 6 meals/day option instead of the 5 meals/day. Based on my logs, opting for the 5 meals/day would have put me at 1200-1400 calories. During this program I have not been unduly voracious. This was a big change for me since programs like Turbulence Training and NROL tend to make me sore initially and ravenously hungry after a few weeks. This was not necessarily the fault of those programs; I am just a naturally hungry girl. 😉 It is just notable that RCR didn’t make me QUITE as hungry as programs with heavier, strenuous lifting. Val has said in her web chats that the RCR nutrition plan is very close to the Zone with lean protein in every meal, lots of fruits and veggies, and limited sugar and processed carbs. If you have done Body for Life or other similar bodybuilding nutrition plans, the RCR meals will look very familiar. The snacks are somewhat smaller than I am used to at 125-175 calories, but not so tiny as to drive me to snacking on extra food. The lack of nagging hunger pangs was a plus in my book since this program (just like any all-inclusive fitness program) will not produce optimal results unless you stick with the diet even more than the workouts. Let me rephrase that in case anyone was in doubt of my meaning: You will not look like Jennifer Garner in 6 weeks if you continue to eat the crap that you normally eat, even if you hit ALL THIRTY-SIX WORKOUTS IN THE PROGRAM! Red Carpet Ready is a 6 day per week exercise program consisting of three 60-minute resistance training circuits and three 30-minute interval cardio sessions performed on alternating days. The book includes three different interval workout patterns that range in difficulty from easy to advanced. I usually used the most difficult pattern, though I mixed things up on occasion with BFL, TT, and Afterburn style intervals. The circuit workouts are comprised of three big total body circuits each, and four different workouts are included in the six-week program. They all make use of the Valslide glider discs, 5-10 pound dumbbells, an elastic fitness band, a 12″-18″ step (I used a folding chair) and a stability ball. That’s about all you need in order to complete this program. The weights used are very light compared to those prescribed by most other programs I have tried, but this is because the target audience for RCR is NOT the woman who wants to look like an Amazonian Oxygen figure model, but one who prefers to look like Jennifer Garner in Alias or Kate Beckinsale in Underworld. I did find the RCR circuit workouts kind of long compared to the 30-45 minutes of lifting I was accustomed to doing, but I always felt lighter and more energized after finishing them. I had better luck maintaining the right tempo and intensity if I performed the circuits in the morning with just my MP3 player blasting music into my ears vs. at night with the TV on. The TV was just too distracting. When I actually kept the tempo of my reps at the right speed and took minimal rest breaks, I finished the circuit workouts in 55-60 minutes and burned between 400-500 calories. The interval sessions usually burned between 220-280 calories when I chose running as my exercise. I feel like my leg muscles were maintained just fine using the lighter loads and bodyweight-only moves of the RCR exercises, but some upper body strength did go away based on my performance on the 100 Push Ups program. I maxed out on 89 reps around week 3 of the RCR program and felt my upper body strength and endurance steadily decrease after that. I’ve always had a tough time building and maintaining lean mass in my upper body and arms without consistent heavy training, however, so your mileage may vary if you build very easily up there. My only other (minor) gripe with the circuit workouts is that they HAD to be performed at home in my case since my gym’s non-slip rubberized floors made it impossible for me to use the Valslides with or without the covers on them. I just like the RAWR! vibe of a gym better than the laid-back environment of my living room. If your gym has a carpeted or tiled area for you to use or if you actually like exercising at home, this is a complete non-issue for you. I also want to mention that I never experienced any delayed onset muscle soreness on this program, unlike others that usually left me sore for several days after my first sessions. I believe that this was because a) the loads were not very heavy and b) I started RCR after 5 weeks of a much heavier, traditional bodybuilding split that included loaded squats, step ups, lunges, and other exercises also used in RCR, so I was already broken in, so to speak. I remained injury-free throughout the 6 weeks as well, including my problematic lower back. Heavy deadlifts and squats tend to wear down my lower back after a few weeks, so a lower body program that can boost my booty and keep my legs in trim without putting my lower vertebrae in peril is an extremely welcome addition to my arsenal of workouts. Since I can maintain my leg muscles with minimal loading and effort thanks to genetics, I’ll probably limit the heavy work to 25% of my training time for my lower body and use RCR moves for the majority of my leg work. Overall, I really liked the RCR workouts and believe that they are VERY effective for achieving Val Waters’s signature long and lean (but not overly ripped) look. I prefer a slightly more muscular aesthetic for my upper body than RCR can provide as written–Amazonian is fine with me!–which is why I am returning to a more traditional heavy program for my back, chest, arms, and core, but I will continue to use RCR circuits for my lower body on leg days. That said, if you are in search of a program that will lean you out but only add enough muscle to make sure you look fit, feminine, and trim instead of skeletal, flabby, and flat when you reach the upper teens to lower 20s in body fat percentage, Red Carpet Ready gets my highest recommendation. For a sample of what the RCR circuits are like, please check out my previous post on Val’s Action Hero workouts. So…I had all of my stats typed up this morning as well as a summary of my experience with the RCR program…and then Internet Explorer just closed itself for no reason, taking all of my wonderfully-verbose, super-detailed text with it! Stupid IE. That will teach me to cheat on Firefox. I couldn’t face typing all of that up again, so you all get to see a lovely screen capture of my measurement spreadsheet instead. It’s probably easier to read anyway! For reference, I am 5’6″ tall and did not manage to grow any taller on the program despite all of my best efforts and all of the spinach, green beans, apples, carrots, and peaches I ate. Please note that while the most inches were lost from my bustline as usual, I also managed to lose 1″ off my thighs. This is normally the very last place I start sloughing off fat, so the 1″ loss while I’m still in the 140’s in scale weight is a significant and pleasant surprise. I still have a good 6 to 8 more weeks of cutting to do before I will be truly lean, but you can already see progress in these photos taken on day 1, 21, and 45. At six weeks, RCR is only half the length of most other transformation programs, so I am still very much a work in progress at this stage. However, I am visibly slimmer from the side view, my legs are looking much more defined and solid, and hey! Are those muscley back bumps I see? This entry was posted in Programs and Progress, Reviews, Workout Plans. Thanks for the program review and congratulations on the results. While you say this didn’t build on your legs – they look ripped from the leaning out – kudos! p.s. Pics look great with the consistent lighting and you being tan on your results photos. Glad you had success with it. I tried this earlier this year. Not only couldn’t I handle not being able to do my “stuff” at the gym, but i had an accident with the ValSlide that screwed up a bit of my summer running plans. I’m a personal trainer, so I know all about form, etc…it wasn’t that. It was that the darn thing decided to take off and take my unsuspecting leg with it during the lunges. My leg went back far faster than it should have and I heard this sickening “BOING” sound come from my groin. I ended up with a very painful groin pull that took forever and a day to heal. For variety and intensity, I loved Jillian Michael’s “Making the Cut.” That was one heckuva crazy-wonderful plan… AND it can be done at the gym. Alison – Thanks! I honestly don’t think I lost ANY leg muscle at all on this program despite the lack of heavy loading, but once again, I’m a genetic freak when it comes to leg muscle. I don’t mind if they stay muscular and larger than most women would want as long as they are lean. Cynthia – Haha…take your upper body and my lower body, and we’d make one awesome figure competitor, eh? Let me know when you are back on RCR. I might be up for doing another pure RCR cycle at that point, too. I plan to alternate between heavier programs like TT and NROL/NROLFW and the lighter RCR throughout 2009. RCR seems like a good recovery program from those more physically stressful routines as well as a good fat loss solution on its own. Glynis – Yes, the working out at home part of RCR was rough on me. And OUCH! I’m sorry to hear about your Valside-related injury. Those things ARE very slippery. I was very concerned about the “curtsey lunge” exercise in particular when I started doing those in week 4. Are you fully recovered now? The groin pull took the entire summer to heal, so I had to modify, modify, modify. Now it is a ghost of a pain. I’ll get a funny feeling that something might happen to it and I back off. You will *love* the Jillian Michael’s book. It is wonderful insanity and you wind up drenched with sweat the entire workout. Zoey – Yes, I’ve been told I should give cycling a try by several people. 🙂 And also that I might be good at speed skating, LOL.